Japanese refiners are unlikely to continue buying Iranian crude from April onwards, the president of the Petroleum Association of Japan said as quoted by Reuters. This makes Japan the second country to try and negotiate a waiver extension, after India entered identical talks earlier this month. 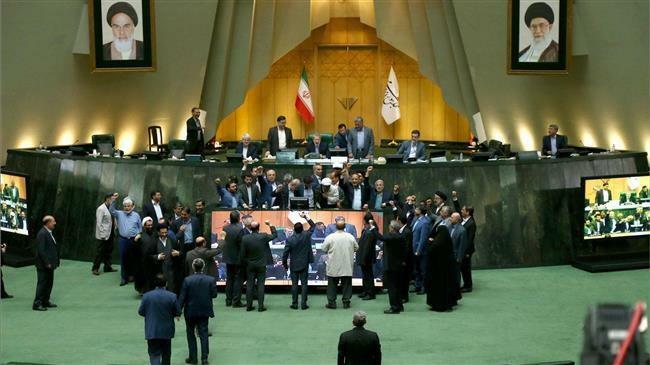 Washington has signaled it would probably agree to some form of an extension as long as the importing countries agree to reduce their intake of Iranian crude. Japan has been very strict in following Washington’s lead in the sanction department, but it has also indicated that finding an alternative to Iranian crude might be tough. “Japan has told the U.S. that the sanctions should not negatively affect Japan’s stable supply of energy and Japanese companies’ operations,” one government official in Tokyo said, commenting on the waiver negotiations to Reuters. "We are closely tracking ship-to-ship transfers of [Iranian] oil to evade our oil sanctions," said Deputy Assistant Secretary of State for Counter Threat Finance and Sanctions David Peyman. "And we're working closely with foreign governments to ensure they are monitoring ship-to-ship transfers off their coasts." It demonstrates apocalyptic Christian Zionists like Pompeo have undue influence on a largely clueless president. The governor of Khuzestan, the biggest oil-rich province in Iran, has banned government officials from leaving it despite the danger of floods in the region, Radio Farda reports, citing a statement by Gholamreza Shariati. "Since there are some concerns over the basin of Karkheh River, forces have been assigned to check the floodgates, and do whatever necessary to confront a possible flash flood in the province," the Khuzestan governor said. The local meteorological service has warned there is a danger of floods in parts of the west and southwest of the country as well as freezing temperatures. While drought is a typical occurrence in the southern province of Khuzestan, now it’s another disaster threatening the region and putting the capabilities of local authorities to handle emergencies to the test. The Khuzestan governor’s statement comes after Iran’s vice president, Eshaq Jahangiri, fired another governor for failing to return from a trip to Europe to oversee the management of the flood emergency in his area. According to a CIA file, Khuzestan accounts for almost 70 percent of the country’s oil production. More importantly, perhaps, the province produces almost all of Iran’s natural gas. It also houses four ports that are Iran’s largest exit point for various exports. America is accusing Iran of starting the instability in the Middle East? that's rather comical coming from an nation that has armed and funded Jihadist groups within in Syria for the past 8 years now and all they do now is blame everything on Iran. Unable to secure a waiver extension from Washington to continue buying Iranian oil, Japanese refineries are putting the brakes on further imports in order to give payments enough time to be processed under the existing waiver. In total, Japanese refiners purchased over 15 million barrels of Iranian crude from January through March, but the waiver expires in early May and payments still have to be processed for those cargoes, Reuters reports, citing industry sources and data from Refinitiv Eikon. In order to avoid sanctions violations, all necessary transactions with banks and insurance companies must be finalized before the waiver expires, with the last cargo set to arrive in Japan on April 9. "In November, we granted eight oil waivers to avoid a spike in the price of oil. I can confirm today three of those importers are now at zero," Brian Hook, the special U.S. envoy for Iran, told reporters. "This has denied the regime access to well over $10 billion in (oil) revenue - a loss of at least $30 million a day," he said. Two South Korean refiners have bought an unspecified amount of U.S. superlight to test it as a potential replacement for Iranian condensate, Reuters reports, citing sources. The country is currently negotiating an extension of the sanction waiver Washington granted it last November. Whatever the outcome of those negotiations, South Korean refiners are preparing for low Iranian condensate intake as the U.S. plans to reduce the amount of oil it permits Iranian oil buyers to continue importing in line with its goal to cut the country’s oil exports to zero. The buyers of the U.S. light, the source said, are South Korea’s largest refiner, SK Energy, and its smallest one, Hyundai Oilbank. “The crude’s API seems to be 48 degrees so in a way it’s possible (to replace Iranian condensate) but again we need to check the oil’s quality,” Reuters quoted one of its sources as saying. South Korea is a major importer of Iranian condensate, but light crude from the U.S. shale patch—especially the Permian—is comparable in terms of properties. The light grades are used to produce naphtha, a feedstock for petrochemicals. VIENNA, April 4 (Reuters) - The U.N. atomic watchdog policing Iran's nuclear deal has inspected what Israel's prime minister called a "secret atomic warehouse" in Tehran, three diplomats familiar with the agency's work said. Tal Inbar‏ @inbarspace · 24 min. Iranian president Rouhani orders installation of 20 IR-6 centrifuges at Natanz site. Japan Grounds F-35 Fleet After Jet Disappears From Radar Over Pacific. Last edited by goldenequity; 04-09-2019 at 03:31 PM. F-35A fighter's wreckage has been found off the coast of northeastern Japan, pilot still missing. Japan's air force loses contact with F-35 stealth fighter as US blames China. 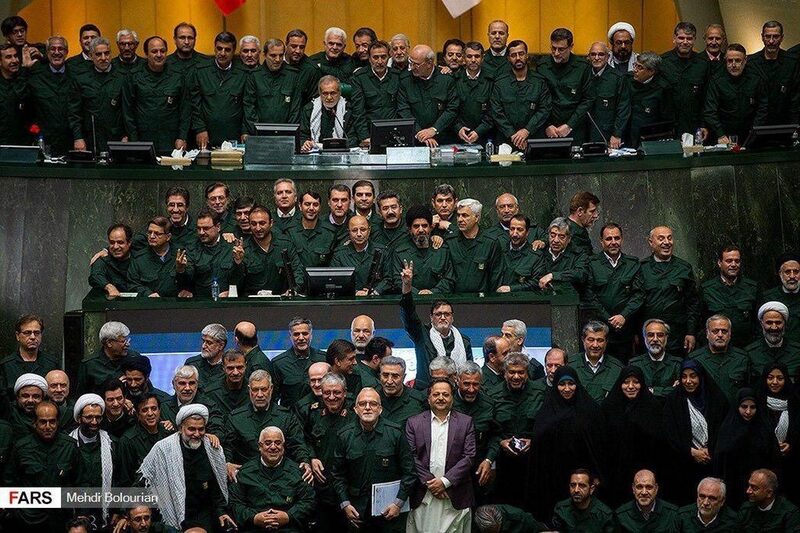 One for all, all for one: Historic picture of Iranian Parliamentary deputies donning the uniform of the Islamic Revolution Guard Corps (IRGC), after its ‘terrorist’ designation by the US. Brought the reformists and principalists together, it did. Muraselon News‏ @Muraselon · 25 sek. Drexl Spivey‏ @RisboLensky · 6 sek. Drexl Spivey‏ @RisboLensky · 3 min. H.K @Ibra_Joudeh · 8 min. Last edited by goldenequity; 04-10-2019 at 06:30 AM. Last edited by goldenequity; 04-14-2019 at 12:16 PM. Pakistan. Iran. Iraq. Syria. Lebanon. What happens when Sovereigns WTFU and realize they have a common opponent!!! 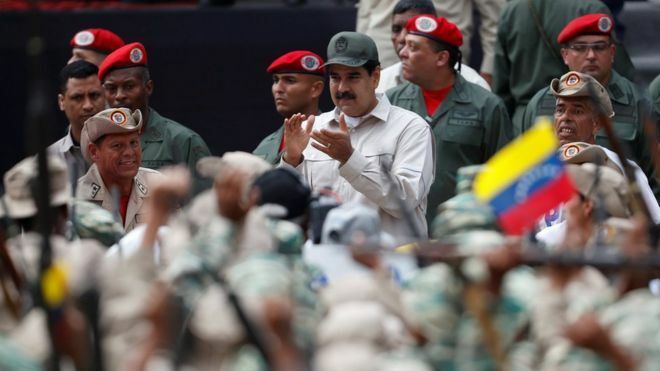 Trans-national militias are ANOTHER excellent idea... like PMUs and Hezbollah. Europe, Latin Am, Asia and most certainly the ME. Governments planetwide are RUNNING to Russia for protection, trade and defensive technology. Good job Mike. Keep up the good work. Last edited by goldenequity; 04-14-2019 at 04:31 PM. Syria, with large oil reserves, faces oil shortage as US occupant army holds the most important oilfields. this is unconfirmed, I hope it is true..
the latest: Apparently sent by Iran, and the Iraqi army/PMU secures the convoy which is heading towards Syria. A video of the convoy circulates. Damascus fuel director (2hours ago): No official information on the supply of oil by road from Iran via Iraq. American occupants must leave the country immediately! They are prolonging humanitarian crisis intentionally. Shame on the US government, and Trump especially! Last edited by goldenequity; 04-14-2019 at 04:44 PM. Under the JCPOA regulations, Iran’s ... is subject to unprecedented international monitoring. **another accnt bites the dust. Last edited by goldenequity; 04-17-2019 at 06:05 PM. CENTCOM covers the Middle East and Central Asia, and coordinates command of all US armed forces in places like Afghanistan and Iraq — both of which hold major potential for clashing up against Iranian forces or proxies, especially true of Iraq. Iran's Defense Minister Amir Hatami said this week that Washington's moving forward with the FTO designation of the IRGC is proof that sanctions on Tehran were failing. More than 250 people have moved from Google and related firms to the federal government or vice versa since President Barack Obama took office. The Google Transparency Project, the work of Campaign for Accountability, poured over reams of data to find 258 instances of “revolving door activity” between Google or its associated companies and the federal government, national political campaigns and Congress since 2009. Last edited by goldenequity; 04-19-2019 at 08:16 PM. Rhetoric is ratcheting up. Are they really going to try to start a war with Iran? When's the FF? A new report in Wired magazine details how Iran has been target of a "Shadow Brokers-style" hack campaign which seeks to expose methods, names, and activities behind an elite cyber-espionage team linked to Iran's Ministry of Intelligence. The Shadow Brokers leaks from 2016 famously targeted the National Security Agency, dumping tools used by the agency online, and later resulted some of the most devastating cyberattacks in history such as the NotPetya and Wannacry attacks, which devastated networks all over the world. Now it appears it's Iran's turn to be targeted by a powerful mystery group doxing Iran's foremost hacking team. The motive appears political in nature, given that along with the Iranian hackers' code being dumped online, the mystery agent behind the leaks posted the following message to Telegram in late March: "We are exposing here the cyber tools (APT34 / OILRIG) that the ruthless Iranian Ministry of Intelligence has been using against Iran's neighboring countries, including names of the cruel managers, and information about the activities and the goals of these cyber-attacks." And further, the initial message ended with, "We hope that other Iranian citizens will act for exposing this regime's real ugly face!" OilRig has long been seen by researchers as an arm of the the Iranian Ministry of Intelligence, active for several years against a number of Middle East and international companies and organizations, and often often starts by executing intrusions against organizations in the supply chain of a larger target. As of Thursday morning, the Read My Lips leakers continued to post names, photos, and even contact details of alleged OilRig members to Telegram, though WIRED couldn't confirm that any of the identified men were actually connected to the Iranian hacker group. "From now on, we will expose every few days the personal information of one of the cursed staff and secret information from the vicious Ministry of Intelligence so to destroy this betraying ministry," a message posted by the leakers on Thursday read. A private cybersecurity research firm cited in the report has confirmed that at least some of the hacking tools released in the mystery attacks and code dumps match OilRig's hacking tools, and have identified victim companies that have been known to have been targeted by Iranian intelligence in the past. It further appears a major and "embarrassing" setback for Iranian cyberintelligence, given further that "the Read My Lips leaker also claims to have wiped the contents of Iranian intelligence servers and posted screenshots of the message it says it left behind, like the one shown below," according to the report. 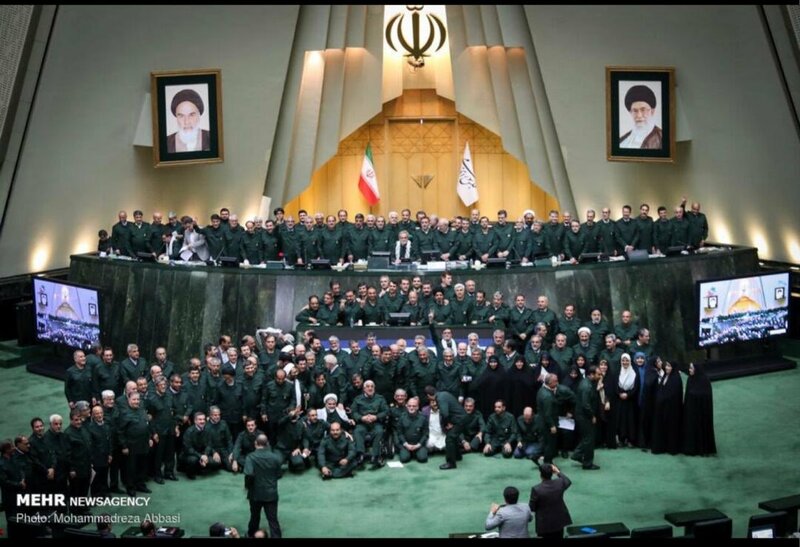 "We have more secret information about the crimes of the Iranian Ministry of Intelligence and its managers," a message from the mystery agent posted last week promises. "We are determined to continue to expose them. Follow us and share!" 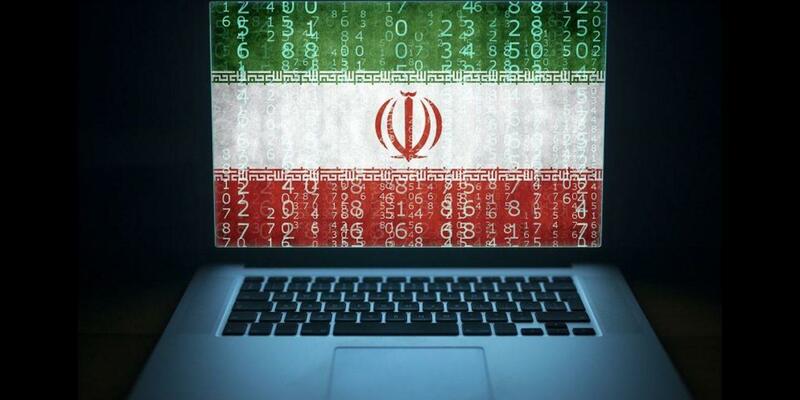 A number of online commentators have speculated that it could be US or Israeli intelligence conducting the current cyberattacks on the Iranian group, while under the guise of a Shadow Brokers-style independent hacker group. Iranian-Indian relations might be about to enter their worst-ever period in modern history as a result of two very important and uncoordinated moves undertaken at almost the exact same time by the American and Pakistani leaders. PM Khan just paid his first visit to Iran where he and his hosts announced that they’ll enter into a new era of anti-terrorist cooperation that geopolitical analyst Adam Garrie comprehensively analyzed in his recent piece on this breaking news event. The ball was indeed in Iran’s court to stop India’s anti-Pakistani Baloch terrorism like I wrote the other day, and to Tehran’s credit, its leadership finally understood this and decided to expand its military partnership with the global pivot state of Pakistan. This will greatly complicate India’s Hybrid War capabilities in clandestinely using Iranian territory to carry out terrorist attacks against Pakistan by proxy as it obsessively seeks to sabotage CPEC, meaning that PM Khan’s visit will have far-reaching and long-term geostrategic security consequences in the New Cold War. In parallel with this, Trump decided that the US won’t renew its Iranian oil sanctions waivers and that Washington’s GCC partners of Saudi Arabia and the UAE will help the Islamic Republic’s energy customers replace their imports with Gulf resources instead. India was very vocal last year about its intent to defy the US’ unilateral sanctions against Iran, but as I wrote in my piece at the time about the “Indian Illusion“, all of this was just rhetoric to hide the fact that New Delhi was quietly implementing its new American patron’s will. Trump just put Modi on the spot, however, and it might augur negatively for the Indian leader during the ongoing month-long electoral process if he publicly capitulates to the US’ demands and replaces Iranian resources with Gulf ones like I suspected he’s been planning to do since late last year after his summit in Argentina with Saudi Crown Prince Mohammed Bin Salman. As such, this American move might also be yet another “bad cop” tactic against Modi to get more strategic concessions out of India. It therefore wouldn’t be an exaggeration to say that Trump and PM Khan might have just ruined Iranian-Indian relations for good when considering the combined effect of their latest moves to that relationship. The Pakistani leader exposed India’s Hybrid War terrorist plot during his talks with the Iranian leadership which probably explains why the two neighboring nations decided to take their military cooperation with one another to the next level, while the American leader is forcing India to stop importing Iranian oil under the threat of potentially crippling “secondary sanctions” and to replace its resources with those from the Islamic Republic’s hated GCC foes.